TEACHER’S NOTES NOW INCLUDED FREE! All 31 DVDs for one special price! Taught originally at The Master’s College in Santa Clarita, CA, this master’s level course presents a biblical perspective on various Christian life issues using “The Pilgrim’s Progress” as a textbook. Optional Teacher’s PowerPoint notes available. 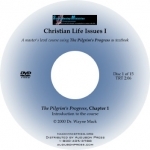 Presents a biblical perspective on various Christian life issues using “The Pilgrim’s Progress” as a textbook. 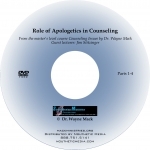 Part 1 includes 15 video classes on DVD, ranging from 45 minutes to 2 1/2 hours. Optional Teacher’s PowerPoint notes available. Continues to present a biblical perspective on various Christian life issues using The Pilgrim’s Progress as a textbook. Part 2 includes 16 video classes on DVD, ranging from 50 minutes to over 2 1/2 hours.